5. RingCentral cheap and outsources to Philipines, where NO ONE can help you. This platform spend more on innovation and updates than most UCaaS vendors spend in total. Complete package, no extras to buy. Cons: Difficult to keep up with all the new features. 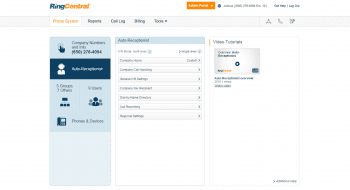 RingCentral has the best in video and audio quality for meetings and phone calls. I wish Microsoft will partner with them instead of Skype for Office365. We have been with RingCentral twice. Stupidly we went back to them almost two years ago. The sales person assured us the issues we experienced in the past were solved. Well they weren’t and after spending hours trying to resolve the issues, no improvement. Essentially every call comes in on two lines and if someone is alone and is on the phone when a second call comes in, the person has to go to a different phone to answer the second incoming call, they can’t put the first call on hold, and answer the second call on the phone they are using. If someone is working remotely, they do not have any idea that a second call is coming in and can’t answer it even if they wanted to!! So we have 3 months left in our contract. I admit to being stupid and not doing a month to month agreement. Shame on me. We asked, politely to be released from our contract a few months early since they could not deliver the services as promised. 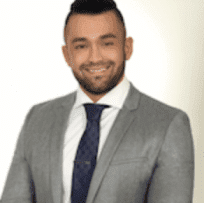 We have found a service who can set the system up the way we require and, for the health of our business, wanted to switch to the new company. Nope they would have none of it. After almost an hour on the phone, speaking to 3 different rep, the final being “Vince”, all of whom would not listen to anything I was saying. There was absolutely no consideration of the fact that we had worked on trying to fix this numerous times to no avail. There was no consideration that I was a dissatisfied customer. All they could do was repeat that I had a contract and had to pay the three months remaining if I wanted to terminate the service. It was my problem not theirs. I was told I should have terminated the service within 30 days of signing up if I wanted no penalties. We were still working on trying to get it to work the making the system work!! Their script-based responses are insulting. They had many, many ways of saying no, we don’t care that we couldn’t provide you the service you are paying for, we want your money and that is all we want. Their approach was condescending and inconsiderate. Live and learn! Pros: None over any other company. Cons: Customer Service, lack of flexibility. Have been a RingCentral customer since 2016. Was not overly impressed with the user interface and sound quality from the start. Was forced to sign a two year contract when I signed on. I made the decision with in the first year that I would leave Ring Central once my contract lapsed. So recently I found the time to sign up with Ooma, I signed up and had my number ported then notified RingCentral I was ending their service. This is when I found out that they automatically renewed my contract for 2 more years. Reading over the contract, they were correct it was in the contract. Needless to say I was very upset! NO COMPANY WHO HAS THE CUSTOMERS BEST INTEREST IN MIND OPERATES THIS WAY! It didn’t matter to them that I was a trouble free client for two years. Automatic renewal locked me into a price higher than any new subscribers would receive. When I spoke with their customer service the response was “you signed a contract”. They were right. Shame on me. So now I will be posting where I can to help keep other small business owners from making the same mistake. I am currently paying the remainder of my contract and using Ooma. Have been a RingCentral customer since 2016. Was not overly impressed with the user interface and sound quality from the start. Was forced to sign a two year contract when I signed on. I made the decision with in the first year that I would leave Ring Central once my contract lapsed. So recently I found the time to sign up with Ooma, I signed up and had my number ported then notified RingCentral I was ending their service. This is when I found out that they automatically renewed my contract for 2 more years. Reading over the contract, they were correct it was in the contract. Needless to say I was very upset! NO COMPANY WHO HAS THE CUSTOMERS BEST INTEREST IN MIND OPERATES THIS WAY! It didn’t matter to them that I was a trouble free client for two years. Automatic renewal locked me into a price higher than any new subscribers would receive. When I spoke with their customer service the response was “you signed a contract”. They were right. Shame on me. So now I will be posting where I can to help keep other small business owners from making the same mistake. I am currently paying the remainder of my contract and using Ooma. Cons: Over priced, Profit driven. 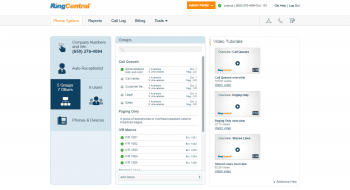 RingCentral was founded in 1999 by Vlad Shmunis and launched officially in 2003. They were one of the first providers to stick their flag in the ground and offer cloud-based IP PBX and phone service. They offer a robust, redundant, and reliable platform that has numerous features. 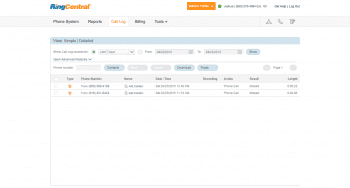 For over a decade, RingCentral has offered small and medium-sized businesses phone features that were previously only available to the largest and richest companies. Now, they have plenty of company, but they still lead the way. 24/7 customer phone support available for Office customers with two or more users. Call Flip: Seamlessly transfer a call from your home device to your mobile device without even putting the caller on hold. 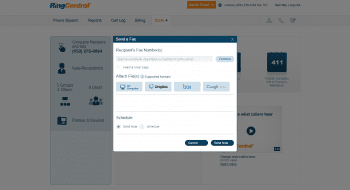 RingCentral was the first to develop this feature, and few others have it. Call screening: Have the inbound caller say their name before they can connect to a call. Glip for team collaboration: Similar to Slack or Hipchat, this feature allows teams to communicate in their own permanent chat room, share notes, assign tasks, and access your files. This is available on all RingCentral Office plans. HD Videoconferencing: Hold conferences in 1080P on your tablet or computer using a regular webcam rather than room-sized equipment. The software automatically focuses on the person speaking. HD Voice: delivers audio in higher quality speech during a regular call. Integrations: RingCentral office seamlessly integrates with business applications such as software suites from Google and Microsoft. What services can be integrated depends on your level of service. Intercom: Talk to your colleagues within the office through your desk phone. Message alerts: Get an email alert or text message when you receive faxes and voicemail. Missed-call notifications: Get notifications via email, text message, and your softphone/app when you miss a call. 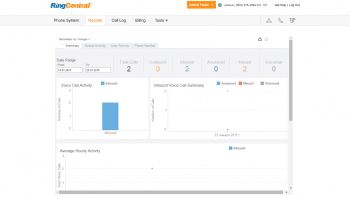 Multi-Level Auto-Attendant: Set up a way to navigate inbound calls to the best agent to take incoming calls. VoIP Paging: Your desk phones’ speakerphones become a mini PA system within a department. Make announcements directly through your desk phone or smartphone. Shared lines: More than one phone can be connected to the same number or extension; no need for call transfers. Single Sign-on: Empowers select or all members in a company to access all the company application with one set of credentials. Toll free minutes: Every plan includes inbound toll free minutes to be shared with all users. Toll free number costs the same as a second local number. Over 300,000 customers can’t be wrong. 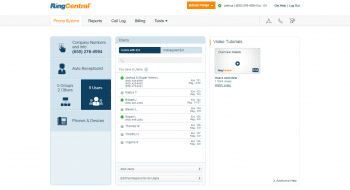 RingCentral has been a perennial favorite of VoIP review sites. They continue to innovate from either their in-house team or by making deals with smart companies. One of their best choices was to enter a partnership with Zoom, making it possible to have HD quality video conferences with large numbers of participants. Formerly, this was only available with huge hardware, some that even needed its own dedicated rooms. Instead, a laptop or tablet is now all you need. This offering is a game changer that few other providers can compete with. 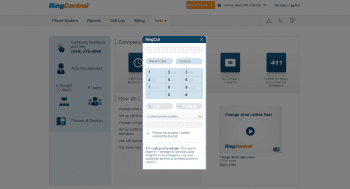 RingCentral has a huge head start over today’s VoIP startups, and but they’re always looking forward rather than resting on their laurels. Every few years, they find a way to reinvent themselves and stay fresh. 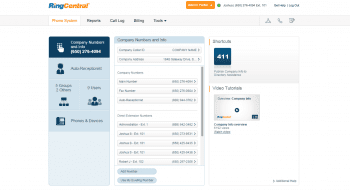 It’s hard to say anything bad about RingCentral, but they do seem a little vanilla. Vanilla, of course, is the most popular flavor of ice cream, so that’s good for most. But, there are some companies out there that like quirky companies and gimmicks. RingCentral stays away from the bleeding edge and sticks to software and hardware with a proven track record. 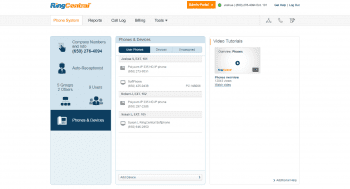 RingCentral has exclusive features, but they aren’t available unless you pay for the top tiers. If you want a great VoIP experience, you won’t go wrong with RingCentral as a whole, but organizations that are able to afford it can get more with RingCentral than with many other providers. 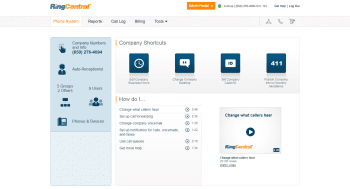 What Do You Think of RingCentral?